I began the year with a broken hand and a job that I enjoyed, but did not pay me all that well. Cost Plus World Market was fun, despite the overnight hours that kept me on a different sleep schedule than the rest of the world. Then, a week into the month, I found out that my job was being cut, along with the jobs of many of my coworkers. I have no hard feelings with them at all, but it came at a very bad time. 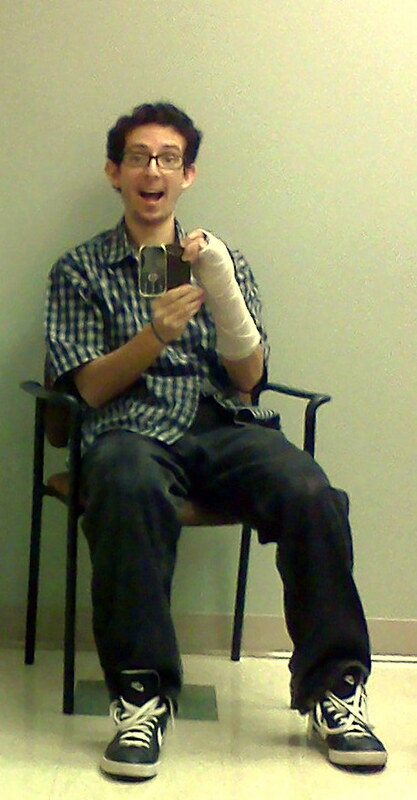 During Christmas, my mom had convinced me to go to the hospital to fix my hand. I did it, but it had been broken for a few weeks and there was nothing they could do for me. This cost me $1200 to learn. I had no health insurance. 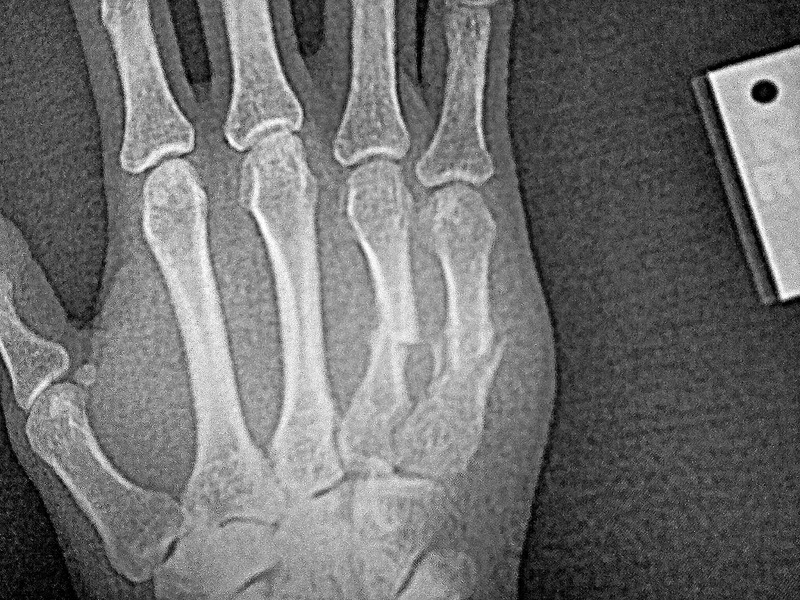 Look at that beautiful fracture! Waiting for a doctor's consultation. Then I found out Catface Meowmers was sick. I found out when he began going crazy every night and urinating all over my bed, including when I was in it. I ended up taking him to the vet and learning he needed special food and medicine. I paid for that with a credit card, maxing said card out. Another maxed out card. It started to snow in Tigard. Beautiful. It is snow time in Tigard! It was really coming down out there. The snow knows no...(wait for it) speed limits. The road became covered pretty quickly. On the other hand, Jackie was still in Korea and I was not used to her not being around me every second of every day. We would talk when we could via Google Talk/Hangout, but it was not the same. I have no idea how people made long distance relationships work before the internet was invented, or even before video chatting was invented. One of the ways I would leave her messages was to record songs for her on my computer. I used my Beatles Rock Band game microphone and then mixed it with the free program Audacity. After a few tough, cold weeks of unemployment, I interviewed and was given a job as a busser/dishwasher at Olive Garden. I was not full time, but it was good pay thanks to tips. One day Portland Trailblazers star LaMarcus Aldridge came in to eat! I ended up getting upset at management however. I was told I would learn to bake the bread so that I could do three jobs and get more hours. They kept making me bus tables and, although I asked, I never got to learn. That kept my hours down lower than I liked. Eventually, I grew sick of it and quit. I had been given less hours than I was promised during my interview and one day I was sent home early, after only working for ten minutes, because they did not need me. Quitting was a rash and stupid decision because I needed the money. My parents lent me what I needed to get by and even Jackie pitched in. I still am paying both of them back today. Thankfully, I have them in my life or I would have been in a lot of trouble. I ended up spending a lot of time sitting on the floor watching Hulu and Netflix (free trial!) with Catface in my lap. Sleepy kitty in my lap. For my birthday, I was given a ticket to the first (technically, second) round of the NCAA basketball tournament at the Rose Garden. NMSU played Indiana and lost. It was disappointing, but I am glad I got to see them play on such a big stage. Later in the month I interviewed and was given the job as the Easter Bunny at a nearby mall. The suit was hot and uncomfortable and the pay was minimum wage, but my coworkers were great, particularly my boss, and I like kids. They would get so happy just because I waived at them (the kids, not my coworkers)! It was fun. Tiring, but fun. A few times I had to be the photographer while someone else was the Easter Bunny and a few times I got to be the cashier. I liked all of it. 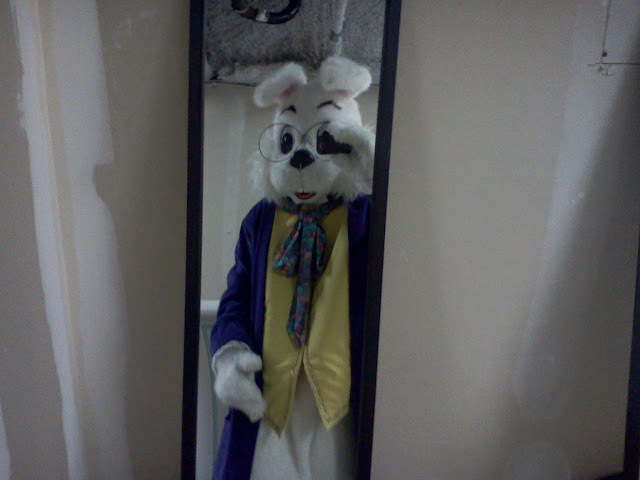 At the time, I was too shy to be very outgoing when I was not wearing the bunny suit. So I was not the greatest children's photographer in the world. I was a pimped out Easter Bunny. That lack of outgoingness would have to dissipate soon because minutes after midnight on my birthday, I received a call from the Mokdong Poly School in Seoul, Korea for a job interview. I was offered the job an hour later. I would finally get to go see Jackie! All I had to do was take care of a few documents and send them to Korea. My future was set. Things were really beginning to look up! Easter Day was April 8 in 2012, so my employment ended the day before. I helped my boss tear down some of the set and went home. I had a couple of weeks to prepare to move across the world. First I had to store my things and empty the apartment. Then I had to take the car and Catface to El Paso to give to my siblings. One cross country trip later (Part One, Part Two, Part Three), I was back sleeping in an empty apartment with only a blanket and my luggage. The night before I left for Korea was very sad, as I wrote in a blog post the next morning. Nevertheless, I grew excited to see Jackie and embark on a new chapter in my life. Again. I arrived in Korea, was shown to my new apartment and told to be ready for a health check in the morning. The next day I did the health check and met some of my coworkers. I trained for a day and then had the weekend to myself. That was when I got to see Jackie for the first time in five months. We had a wedding to go to for one of her coworkers the next day. It just looks like a normal Catholic church. The Catholic wedding was similar to the ones in the United States, only with more bowing and, or course, all in Korean. After the wedding was a reception and buffet. Later, we headed to Namsan Tower to hike around for awhile. As we walked down from visiting the tower and "locking our love" on the rail, I pulled Jackie to a secluded area and asked her to marry me. And that ended April. Lock your love at Namsan Tower. Part Two will come out soon!